My friend and neighbor, Michelle, is a fabulous artist. When you walk into her home you are surrounded by her gallery of beautiful paintings. She is also an art teacher. A couple of weeks ago she invited me to come to one of her classes that she holds in her home. Michelle was wonderful. She explained how to use the white and darks to make your image pop. It was really fun despite the fact that I was the only first timer in the class and wished more than once that I could hide my creation under the table. Michelle said that I had just been looking at it for too long. And that if I just put it up and came back in a couple of days it would look better to me. I could relate to that as that is sometimes the case with making cards as well. But the difference is that instead of having to draw your image there is this really cool thing called a stamp! Well I thought I would give the 2 day test a try. Nope. It still looked pretty bad to me!! lol So why do I stamp? Yup you guessed it! I CAN’T DRAW!!! Beautiful…I love the blue and white combo! Thanks for sharing. Your card is beautiful and sure that your tulip is also lovely, you are probably being too critical. Absolutely gorgeous! Love the clean lines and fresh colors. The stunning image done in emboss resist is awesome! Actually your painting looks quite nice to me. I love your tulip card. I may have to CASE it. Wow this is really beautiful, love it!!! This card is gorgeous!!! The blue back ground is really amazing! I am sure your tulip painting is beautiful too. This is a wonderful take on my lesson, beautiful card!! I still love your hand painted tulip though. You really did do much better than you think. Wish I could show you my first efforts but I tossed my worst ones. You did see the differences in my boats though, 2 years of learning makes a huge difference!! Your painting looks great to me, but your card is really pretty. I love the blue and white with the He is Risen sentiment. Lovely. This is gorgeous…He is risen Indeed! Absolutely stunning! The colours are wonderful! Such a soft and soothing feeling this card has. You are probably too hard on yourself for painting…lol….from what I can see it’s pretty! I can’t paint either, not even a wall, that’s why I stamp too…haha! Susan, this is a beautiful card and the painting looks nice too. I like anything in blue! And I tell people EXACTLY the same thing—I can’t draw, so I stamp! And you do that in SUCH a nice way! Oh, you’re so funny! I don’t know…what I can see of your tulip painting looks pretty darn amazing! You know, even if you can’t or don’t want to draw I’ll bet you learned a lot in the class about shading and coloring. Your stamped card is just gorgeous! I love your beautiful background and the white embossing looks fabulous against it. Susan, you are way too hard on yourself. This is beautiful! Thanks for showing us your hand painted tulip. It does look better than you think. Much better than my attempt does. Your card is just gorgeous though. Susan – your card is as perfect as your painting!!! It’s FABULOUS!!! 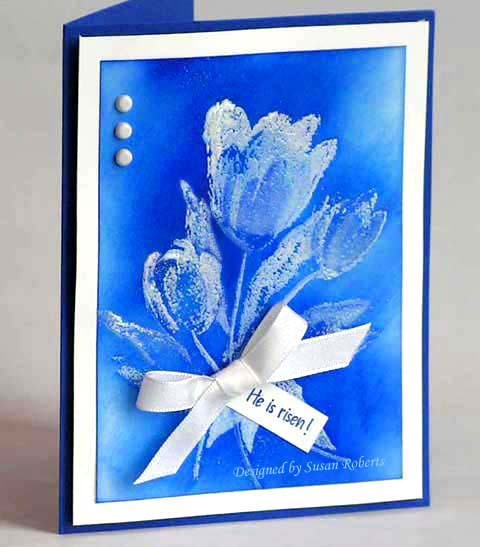 I love the rich blue background and the embossed tulips….and boy I’m glad someone invented stamps too – LOL!!! LOL. You’re so funny! I can draw, but I’m too lazy to do it. That’s why I stamp too! 🙂 Gorgeous card! I love how the white pops right out of the blue! This is too funny! Your card is gorgeous, and from the little photo, your drawing looks really amazing too! My guess is that you’re being way too hard on yourself!